Apologies for my absence- I've just returned from a few days in Barcelona but forgot to flag it up on the site in the getting away rush. Upon my return I have just spent five hours glued to the telly watching recorded highlights of the Sydney test. Odd? Crazy? Probably, but sporting enthusiasm is nothing to do with rationality. During the nineties I visited West Indies, South Africa and Australia at a cumulative cost of over £14,000 to watch England sides lose hopelessly, including that historic innings dismissal for 46 courtesy Curtly Ambrose at Port of Spain. The Brisbane loss in 1994 was no less painful. I remember an Aussie pundit opining that Michael Slater was the worst fielder in their team yet he was better than any in the Pom side. Probably true too at the time. At the end of the full series another pundit wrote that there were only two successes for England: Darren Gough and the Barmy Army. Well, times have changed a bit; Goughy has departed into dancing celebrity but the BA has graduated into a first class truly dedicated fighting unit. Revenge is so sweet. 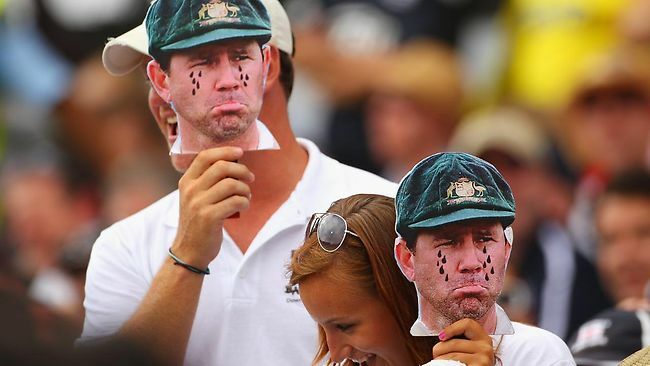 Not that cricket lovers genuinely hate the Aussies; we only pretend to in a pantomime kind of way. 1. The fielding was top notch throughout. it's the symbol of a team's professionalism and every fielder ran flat out for every ball and backed up in exemplary fashion. The catching not unrelatedly, led by the outstanding Collingwood, was out of this world. 2. The mental attitude was rock solid. As someone who used to get anxious myself at my own feeble attempts to play the sport, I was full of admiration for the likes of Strauss, Trott, Swann, Anderson as they remained ice-cool as the tension ratcheted up in front of massive crowds. Though it was interesting how they melted away as the visitors tightened the screw. 3. Strauss proved himself an excellent skipper. I was impressed by his sound judgement over use of the review system, seldom wasting an appeal and sensing when the ball had brushed shirt or pad rather than bat. 4. Of course the batting was exceptional with Cook a revelation- an average of 128 speaks for itself but four others averaged over 50. 5. And the bowling of course was key. To win three times by an innings is just unheard of. Overall, it is fair to say, we played not like England, but like Australia: aggressive, meticulous, with cohesive teamwork and the ruthlessness which marks out top teams. Australia were a shadow it's true, but only last year, recall, they beat the formidable South Aficans and were by no means a pushover. England was just too good, something I did not think I'd ever say. Of their team I thought Shane Watson was a bit unfairly criticised by our pundits: he did score nearly 435 runs at just under 50 and often looked threatening with the bat though seldom with the ball. Finally, I'm not sure the Aussies lost with any real grace. Ponting was very generous I thought but his team mates were churlish in not applauding Cook's magnificent Sydney knock and Hughes' attempt to claim a catch he knew had bounced was quite shameful.